There are over 200 majors, minors and combined-degree programs at Stony Brook University. Science, technology, engineering and math (STEM) fields contain some of the most popular majors at the university. In Fall 2018, 320 students were enrolled as English majors while 983 students were enrolled as computer science majors, according to enrollment data from the university’s Office of Institutional Research, Planning & Effectiveness. According to a report by Economic Modeling, in 2016, the number of STEM majors in New York shot up 45 percent, while humanities was stagnant. Humanities include majors involving ancient and modern languages, literature, philosophy, history, human geography, law, politics, religion and art. These majors foster curiosity, creativity and empathy within the students who study them. We need the humanities to understand other cultures, analyze human behavior and communicate effectively. After taking News Literacy, a fundamental journalism class, I learned not just how to be a smart news consumer, but also how to analyze certain human behavior in the way that people consume news. In my Music Cultures From Around The World class, I am becoming more aware of the different cultures around the world and what kind of instruments people use to make music. This course has already given me a better appreciation for other cultures around the world. In September 2017, cuts designed to reduce a budget deficit were being proposed directly toward the humanities. Students and faculty were incensed. It was reported that not only were there plans to make reductions in non-tenure-track faculty lines, but three assistant professors of cultural studies were told their contracts would not be renewed past 2018, according to an article by Inside Higher Education. Many were actually so angered at the proposed cuts of humanities within the university, that 5,793 people signed a petition opposing them. One of the points the petition stressed was the fact that “the decision to suspend undergraduate majors, Ph.D. programs and merge departments without consulting the faculty and students affected is an attack on the Humanities and the Arts.” According to Newsday, student admissions were suspended in comparative literature and several language disciplines were consolidated in 2017. The Writing and Rhetoric adjuncts were also replaced by professors who weren’t fit for the position, which wasn’t in favor of the students or the adjuncts. According to The Statesman, “The adjuncts were told that full-time lecturers from other disciplines, including pharmacology and geology, would take their places.” Not only were students going to be taught by unqualified professors, but many adjuncts lost their jobs and were afraid of what would happen to their programs. 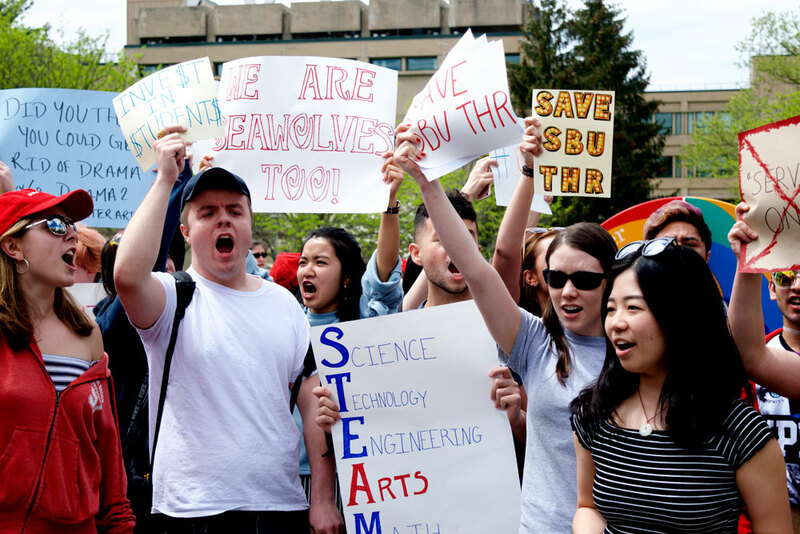 The two people closest to these cuts are the Dean of the College of Arts and Sciences, Sacha Kopp and Provost Michael Bernstein — both of whom have either resigned or will resign after this year. “We are building resources in key departments that have demonstrated academic and scholarly excellence,” Kopp said in an interview with Newsday regarding the budget cuts. According to Inside Higher Education, after two faculty members in the theatre arts department received notices of non-renewal, the theatre arts major at Stony Brook also suspended admissions, effective Fall 2018. The department will transition into a “service department,” where students will be able to take courses that fulfill curriculum requirements, according to a report by Michaela Kilgallen, former editor-in-chief of The Statesman. Although Stony Brook doesn’t have a strong reputation for its arts programs, it was unfair for the theatre arts major to be cut because of how unexpected the decision was for both students and professors. Also, the Staller Center of the Arts has a side dedicated toward theater, which doesn’t hold any STEM classes. Without there being a theater major, the side seems to be a waste since it’s not being used to practice the craft of theater, other than performances by student groups. All majors should be treated with equal respect and be given the same opportunities. Being a journalism major, I fear that one day there could be cuts from the School of Journalism. Cutting humanities majors and professors sends a clear signal that the school neither appreciates nor considers them important. It’s simply another way of saying the humanities means less than other majors and newsflash — they most definitely don’t.